Our new report, published by the Georgetown Climate Center, answers this second question. 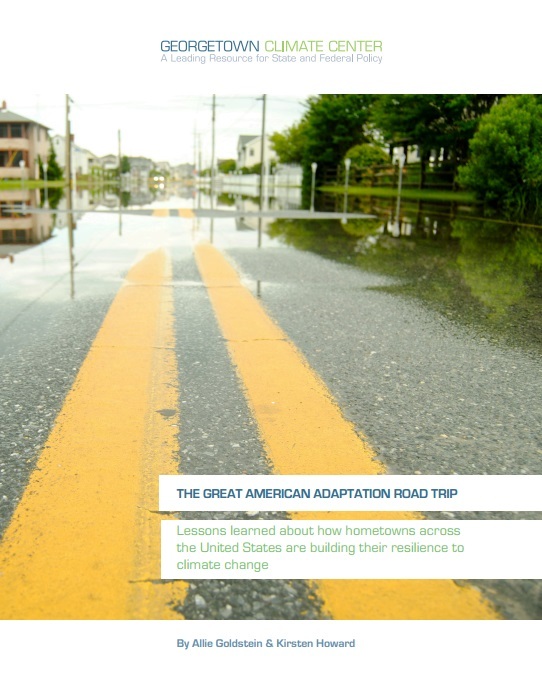 Through it, we distill six lessons learned about resilience from the dozens of communities we visited over the course of the Great American Adaptation Road Trip. 1) Communities have many reasons for building resilience, and the co-benefits of climate adaptation projects are often key to getting them implemented. Think: The dune habitat restoration project in Galveston, Texas that provides natural storm protection but also engaged 300 inner city Houston youth. 2) The likelihood and magnitude of the climate impact itself affects the nature of the resilience-building actions that can be taken. For instance, gradual sea-level rise allows for iterative, long-term planning in North Carolina while emergency planning is the way to go when facing sudden, extreme events such as flash floods, hurricanes, or forest fires. 3) Scaled-down climate science is essential for local planning and decision-making in many sectors. In Portsmouth, New Hampshire, researchers ran local data through global models to find that sea-level rise in the area will be slightly slower than Boston but faster than in the Pacific Northwest. 4) New relationships and partnerships across local governments and with private and non-profit allies can leverage the key skills needed to adapt to a changing climate. Cases in point: Airbnb partnering with San Francisco’s Department of Emergency Management to offer safe havens during disaster, or various city departments in Baltimore coming together to combat the urban heat island effect. 5) Communities need new funding and financing models to enable the investment needed to adapt to climate change. For example, a stormwater utility fee in Ann Arbor, Michigan has raised $5 million to reinvest in public flood protection projects and an urban tree program. 6) Sometimes adaptation and mitigation goals will conflict; but often times communities can reduce emissions while preparing for impacts. Our podcast from Long Island, New York explains how a post-Superstorm Sandy solar boom is both cutting carbon emissions and preparing residents for the next storm. You can check out the report here, but we’ll also be posting its six main chapters one by one over the next couple of weeks in hopes of fostering discussion.